Just because I think this weekend would be the best for sharing my experience, I am deliberately opening the knot of the memory-sack containing all bitter-sweet (mostly sweet) snippets which I have gathered from the SPIE Optics + Photonics, 2016 – World’s 2nd largest optics based conference. Let’s recall, what did I actually gained and what was the thing I got rid of and how I really felt evolved after attending such an ordered celebration. I am in dilemma on whether to add my first “in-transit” international journey experience or not – it taught me something – never ever get panicked. In a nutshell, to avail the cheapest routes, we (me and @Amit Kumar Jha ) had chosen to travel via China with an initial layover of only 2 hours in Kunming, which was proven to be near fatal decision. We almost lost our next flight to Shanghai due to poor communication Tx-Rx service (see it means neither they could understand us nor we) but with the help of our airline’s officials we made it “PERFECTLY” on time. 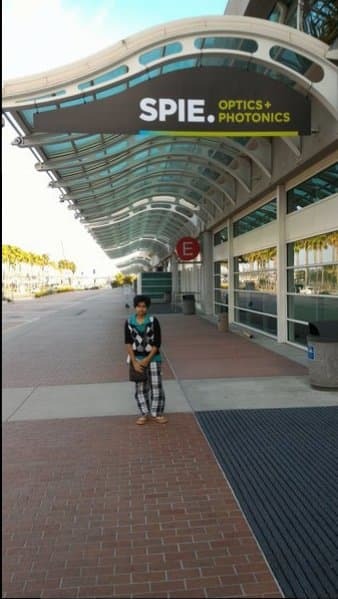 Rest of the journey was comparatively less adventurous and from Shanghai, we reached Los Angeles in the wee hours of 25th August 2016 (I screamed loudly while we were about to land in LA because I clearly saw HOLLYWOOD sign! Never mind). From there we hurriedly availed the Prime Shuttle service (more expensive than Flyaway bus) and reached the Union Station. Ultimately, all thanks to Amtrak service, we reached our destination San Diego, Downtown on the same day (For a traveller, it would have been a better idea to visit Ocean Side and Salona Beach which falls just before the San Diego, Old town station, besides we were ahead of the conference time). My first whole-hearted appreciation goes to the people of southern California. Before I jump into my first day experience in the Student Leadership Workshop, 2016 I MUST SAY many of us (especially a section of ill-minded Indians) boast of their culture actually for no reason. I am very sorry to say, they were the best people I have ever seen in terms of hospitality and mannerism. MAN, I really feel, we should go in bunch to learn how to be good with the strangers. Anyway, skipping to the main point, our first day of the conference was already destined to place in the Mariana Ball Room E and to claim our seats, we made it through the registration desk and devoured all the yummy breakfast items we saw styled on the buffet. Just from there, we tested our skills of networking and tried to be friends with two Ukrainian undergrads. When I entered the hall, I first saw our student coordinator Ms. Meagan Harris and exchanged a smile. While registering, we were directed to seat according to the playing cards (stitched with our identity card) and I had 7 of diamonds for the first half and ace of spades for the 2nd half. It was my first time and I felt odd, but none the less I was excited too. My table comprised 9 members and all from different countries. Country wise – India met Slovakia, Ukraine, China, USA, Latvia on the same table. According to the stats, there were people from 250 countries, no wonder I got to see faces from those countries about which I didn’t know much. Our table facilitator was Ms. Sonika Obheroi from UC, San Diego. The gathering was addressed by Mr. Eugene Arthurs, CEO of SPIE and later on Ms. Tasha Chicovsky tried to welcome each and every one by uttering “welcome” in almost 100 + languages. There was a small ball dance between two table facilitators which warmed us up and finally we were set to face our instructor Mr. Jean Luc Doumont ( PhD. Stanford University ). He had given a key speech regarding the day’s work and motives and after that we faced the first half of his lecture. It was a very well equipped section containing various aspects of leadership qualities and how could we enhance ourselves but not losing our basic sense. One thing I liked about our teacher is that, he was very clear about his point. There were not many “ifs” and “buts”, yet the exceptions were clearly conveyed and we knew what we actually have to do if we want to develop as a management head. Just before the ending of the first half - our first assignment was clear to us. We had to pictorially express “what a good leader should be”. Some other teams were directed to do on “what a good leader should not be”. We made a tree, and we thought the tree system to be a good leader which takes ideas from his subordinates (ie. roots taking minerals, water from soil) and gives an output product ( fruits, flowers) [ Not sure what Amit’s team had done: please add your point in the comment section]. One representative from our team, Laura from Montana State University went to the stage and expressed our ideas. Then ----- The lunch time!! We had a cool lemon tea with mixed vegetable continental food and Choco desert. There we met a group of Indian students hailing from IISC Bangalore, NIT Trichy, Kochi Technical University, Punjab University etc. After lunch we resumed the session – in a different table. We had to enact a situation that we face regularly in our chapter. Our Facilitator Ms. Pernille Klarskov Pedersen from Brown University helped us nurture some crucial points and develop a content related to that. 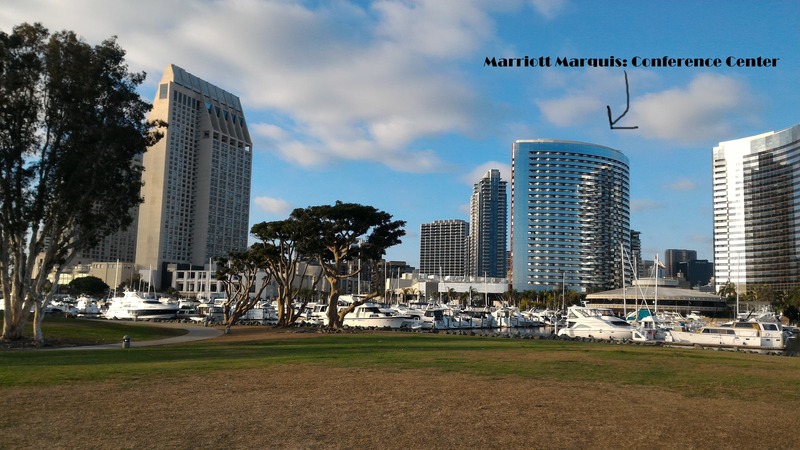 With a brief networking session, the event came to a closure and many of us moved into the different plenary talks that were taking place in the San Diego, convention centre and some of us moved out to roam around the city. On the next day we had a brief panel discussion and we got the opportunity to meet the path-breakers of different genres (academically and industrially). Amit and I had also managed to exchange few words with Mr. Robert Cheng of Apple and tried our best to tell the scenario that we regularly face in a bid to climb up. 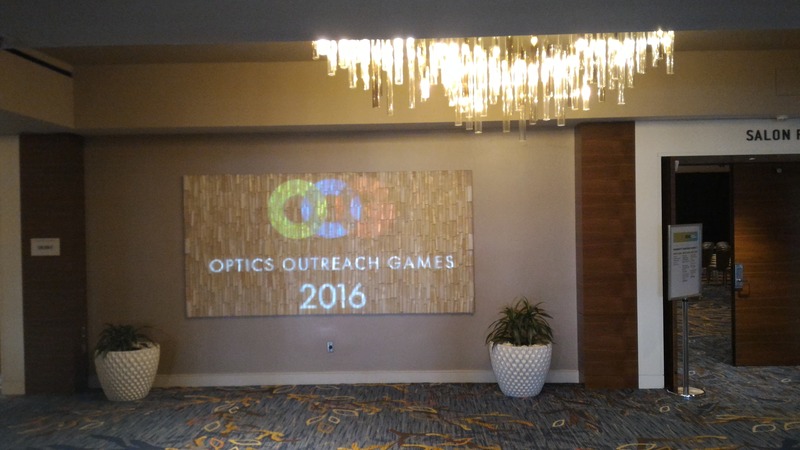 In the evening we had our very own Optics Outreach Games. In the show, we presented an open source project - “A Liter of Light” that we are currently thinking to start in the village areas of our locality. Plus a colored shadow experiment that we generally show our intended audience (students of class 8 -10) to lure them into physics. The third experiment was a little tricky and I had to develop it first using Autodesk SketchBook Pro but had to come up with a way so that the school children, having no facilities, could also devise them in home using permanent markers. It’s a “Moving Dino” animated optical illusion with the help of OSP sheet. ( eg. of Moire Fringes – a way to see non-linear interaction). 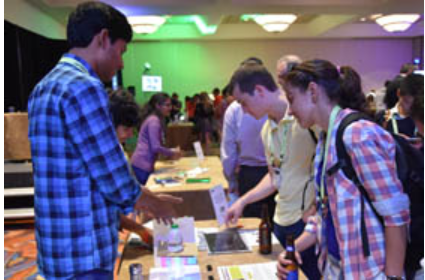 We received loads of compliments, support for the experiments and met some big shots of optics and photonics. The response was overwhelming but I would say it would have been a lot better if the environment was a little noiseless. Never the less, we enjoyed it and it really pushed us to perform the same experiments more than 30 times. Some more highlights from the day after the OOG, 16, we attended the noon session of “Convey your messages with graphs” (the name was not entirely same but the meaning is definitely the same). It was exciting to see Dr. Doumont once more with his sensible talks. And yet again, he showed us an unconventional approach to embed our messages with graphs. Talking about an example, he told us that how he gets confused reading different road signs. The messages should be clear and it should not be very hard to read and reciprocate. The next day was really an enthralling day for us in O+P 16. We could manage to ask for two issues of SPIE Optical Engineering journal and one issue of Astronomical Telescopes, Instruments, and Systems. We were happy to collect some giveaway items, posters, tricky solar light sources and after that it was our turn to stitch our poster on a pre-allocated area. Boasting of our own poster, it was the one and only handmade poster created in the crowd of 50 others. On the other side there was a huge exhibition going on related to the adaptive optics products, IOP to Photonik to AIP, we were amazed to see the best of the best publication house members and applied in some free subscription available for journals in three of them( definitely on our topic of interest: chaos, plasma and optical engineering ). Very specifically, there were 400+ instruments from 180 companies like Thor Labs, Edmund Optics, Newport technologies, Keyence, Microsoft, Optimax, Bruker, Canon, Perkin Elmer etc. And there, people can get a “deep freeze”. One thing I liked the most about the exhibition is that the exhibitors were always happy to attend to students, faculties and interested people. They never forget to smile, they never forget to offer their best services to the people. 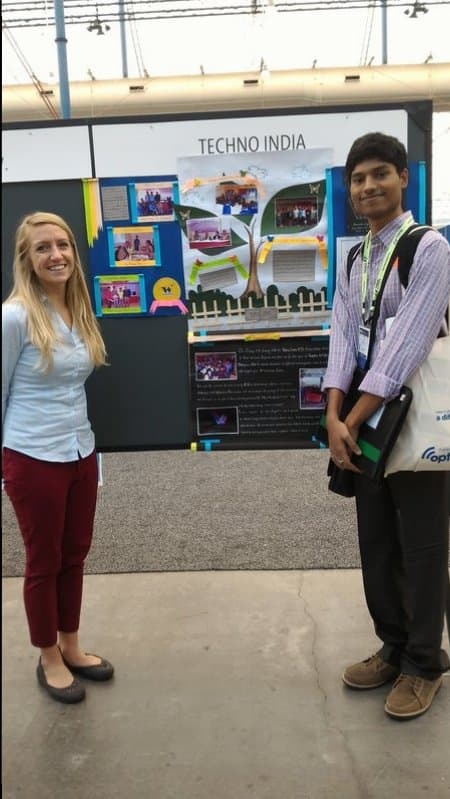 Next to the exhibition booth, there was a job fair section where companies and institutions like Jet Propulsion Lab, Lockheed Martin, Oculus, Raytheon, Applied materials, General Atomics Aeronautical came to talk to the attendees and HIRE THEM/PROVIDE THEM INTERNSHIPS IF THEY REALLY SUIT THE JOB. We managed to apply in 4-5 companies and institutions with our CVs and felt again, that we need to learn professionalism as well. It’s not being rude, it’s not showing others that they are the boss but being courteous with a genuine smile. At least the HR section of all the companies assembled to choose the best one and yet maintain an approachable environment. At 3:30 pm on 30th August we had our chapter poster exhibit mixer where we went and stood next to our respective poster. People started to visit each poster and comment on them, ask for some explanation and exchange their contact cards with each other. 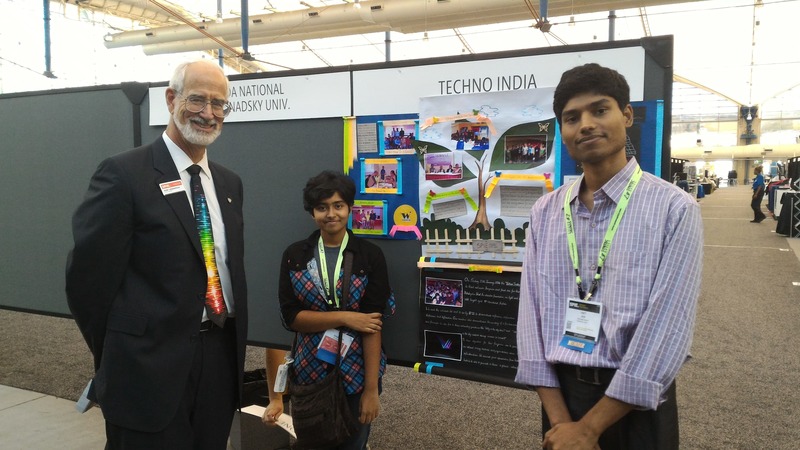 Giving a breath of relief, our SPIE president Dr. R.A. Lieberman appreciated our efforts to craft a hand-made poster assembly. We invited him to visit our institution which he readily accepted. All together the journey was simply a one of a lifetime experience, and suddenly we felt we have grown up. Without having any prior involvement I cooked food using a coffee machine, without knowing how to talk in Chinese I learned the words that make sense, overcoming the fear of strangers I reached out to talk and help others and while coming back, I got stuffs that would help each next step of life. Little about Amit, ahmm ahmm …. 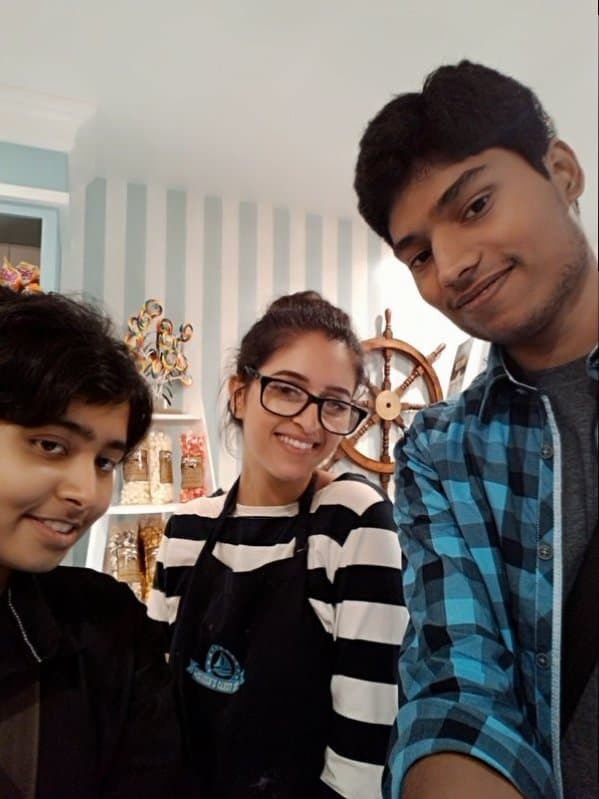 He had fallen for a candy shop owner..… Well the rest should be kept a secret! 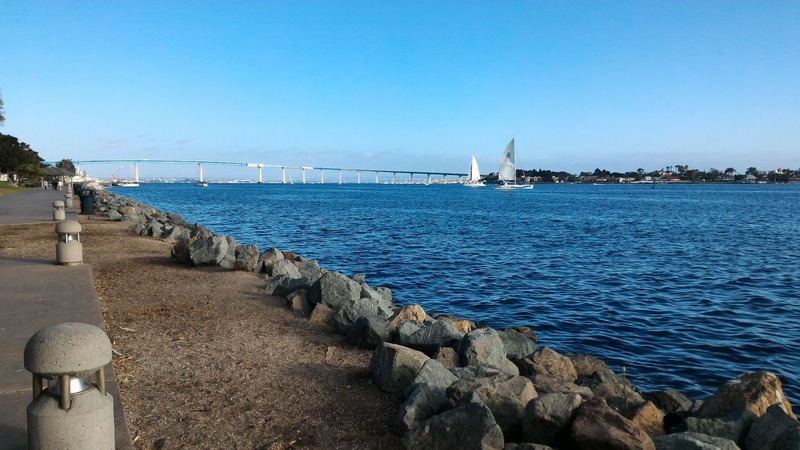 We roamed through the streets of San Diego, explored the beaches, learned the crossing signs, practiced brisk walking and finally, we knew what to do after we would come back. This experience is entirely mine and any of the aforementioned information is not meant to hurt any individual feeling, culture, association. Apologies for all the bracketed information and bad quality images. Unfortunately, we had a mobile camera and that's how we have taken the images. Yes, it was a great experience. We not only learnt a lot about their culture but also met and made new international friends. We not only acquired new skills but also established networks and built important academic plans and established new goals. We opted this opportunity leaving behind our campus placements, doing all the odds and finally, as we thought, it turned out that we made the right decision. SPIE Optics+Photonics taught me several things - some of them were to continue my studies, take risk in my twenties, to switch now if i feel so as i won't get that opportunity later. And definitely i would like to thank @Ankita Katdare mam, the CE team also who stood by us during this journey, your words always motivated and supported us.